Logo of the Knights of the Golden Circle. Image available on the Internet and included in accordance with Title 17 U.S.C. Section 107. KNIGHTS OF THE GOLDEN CIRCLE. The Knights of the Golden Circle (K.G.C. ), a secretive organization created in 1854, proposed to establish a slaveholding empire encompassing the southern United States, the West Indies, Mexico, and parts of Central America. Centering on Havana, this empire would be some 2,400 miles in diameter—hence the name Golden Circle. Leaders of the K.G.C. argued that their empire would have a virtual monopoly on the world’s supply of tobacco and sugar and perhaps cotton and have the strength to preserve slavery in the South from constant attacks by northern Abolitionists. George W. L. Bickley, a Virginia-born doctor, editor, and adventurer, was one of the founders of the K.G.C. According to the records of the K.G.C. convention held in 1860, the organization was “originated at Lexington, Kentucky, on the fourth day of July 1854, by five gentlemen who came together on a call made by Gen. George Bickley….” Bickley then occupied himself with other projects during the mid-1850s, and the K.G.C. did not become active until 1859–1860 when he undertook an organizing campaign across the southern states. As he promoted his organization, Bickley focused on the annexation of Mexico as an essential first step. Newspaper editors across the lower South generally reacted favorably to his message, and Texas proved notably strong in its support. Within a relatively brief time, he organized thirty-two “castles” or local chapters in various cities, including Houston, Galveston, Austin, San Antonio, Marshall, Jefferson, and La Grange. Many prominent Texans joined the K.G.C., and Bickley even courted Gov. Sam Houston, who reportedly became an initiate. Houston, however, regardless of his interest in annexing Mexico to the United States, could not accept the K.G.C.’s anti-Union stance and refused to support its schemes. Knights of the Golden Circle meeting in Brownwood. Image available on the Internet and included in accordance with Title 17 U.S.C. Section 107. In the spring of 1860, a small group of K.G.C. members gathered at the Rio Grande for an invasion of Mexico, but Bickley failed to appear with a large force that he claimed to be assembling in New Orleans, and nothing came of the venture. A group of Knights in New Orleans then publicly attacked him as a liar, coward, and inept leader. Bickley responded by calling a general convention of the K.G.C., which met in Raleigh, North Carolina, on May 7–11, 1860. The convention confirmed Bickley as leader and published a lengthy address to the people of the southern states that remains the most reliable statement of the K.G.C.’s organization and goals. The K.G.C. developed a second plan for invading Mexico later in 1860, but it proved abortive as attention turned to the presidential election and the secession movement that followed immediately across the lower South. Unionists in Texas claimed that the K.G.C. played a role in reducing the vote for Constitutional Unionists (see CONSTITUTIONAL UNION PARTY) in November 1860 and in keeping Unionist voters from the polls when the state held a referendum on secession in February 1861. Once Texas seceded in March 1861, individual Knights participated in the actions that displaced the authority of the United States in Texas, leading some Unionists such as James P. Newcomb to emphasize the role of the organization in destroying the Union. The truth of all these charges cannot be determined with certainty, but secession definitely represented majority opinion across the state regardless of the K.G.C.’s role. 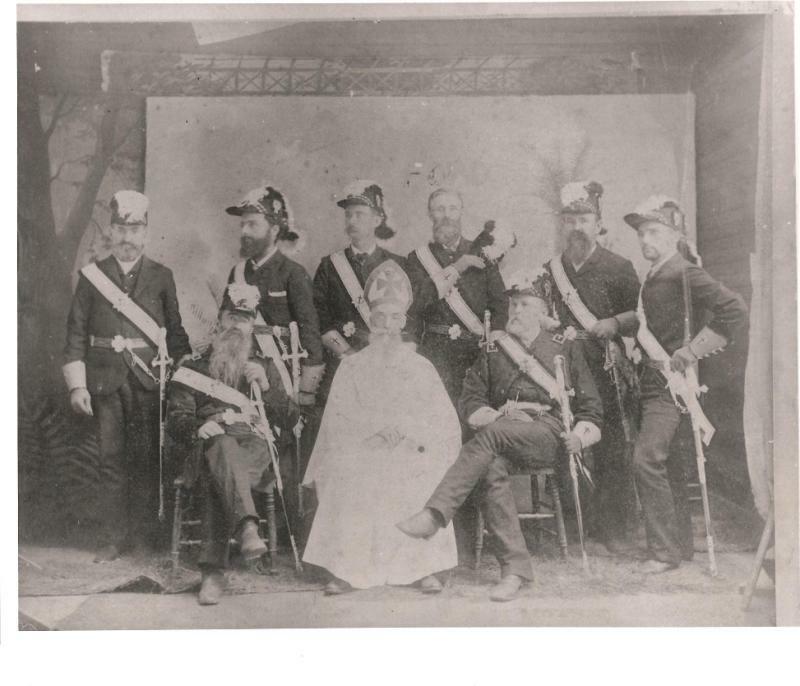 During the Civil War, leaders of the K.G.C. served in the Confederate Army not as members of the society’s military division per se, but simply as soldiers in the southern cause. Elkanah Greer of Marshall, for example, served with distinction as colonel of the Third Texas Cavalry, a unit in the cavalry brigade commanded by future governor L. Sullivan Ross. The K.G.C. itself probably received greater attention during the war for its supposed role in a treasonous plot variously called the “Northwest Conspiracy,” the “Copperhead Movement,” and similar names in the old Northwestern states such as Indiana and Ohio. Joseph Holt, United States Judge Advocate General, submitted a report in October 1864 that warned Secretary of War Edwin Stanton about the danger of this plot, which he attributed at times to the K.G.C. and at other times to different treasonous groups. If such a plot existed, nothing came of it, suggesting that the rumors were just that or that the K.G.C. did not have the strength attributed to it in such reports. Victory by the Union in the Civil War destroyed the cause for which the K.G.C. had been created and, therefore, ended its life. Bickley, who served as a surgeon in the Confederate Army before being arrested as a spy in Indiana in July 1863 and held until October1865, died in August 1867. Reports of K.G.C. activity circulated for a few more years, but there is no dependable evidence that the organization survived the war in any meaningful way. Perhaps the greatest historical significance that can be assigned to the K.G.C. is its contribution to creating the emotional excitement necessary to persuading southerners to rebel against the United States. Ollinger Crenshaw, “The Knights of the Golden Circle: The Career of George Bickley,” American Historical Review, 47 (October 1941). Roy Sylvan Dunn, “The KGC in Texas, 1860-1861,” Southwestern Historical Quarterly 70 (April 1967). Donald S. Frazier, Blood & Treasure: Confederate Empire in the Southwest (College Station: Texas A&M University Press, 1996). Warren Getler and Bob Brewer, Rebel Gold: One Man’s Quest to Crack the Code Behind the Secret Treasure of the Confederacy (New York: Simon & Schuster, 2004). Joseph Holt, Report of the Judge Advocate General on “The Order of American Knights,” alias “The Sons of Liberty.” A Western Conspiracy in aid of the Southern Rebellion (Washington, DC: Union Congressional Committee, 1864). K.G.C., Records of the KGC Convention, 1860, Raleigh, N.C. (http://gunshowonthenet/AfterTheFact/KGC/KGC0571860.html), accessed August 27, 2010. Handbook of Texas Online, Randolph B. Campbell, "KNIGHTS OF THE GOLDEN CIRCLE," accessed April 24, 2019, http://www.tshaonline.org/handbook/online/articles/vbk01. Uploaded on September 19, 2010. Modified on June 18, 2018. Published by the Texas State Historical Association.